A stupa is a dome shaped structure, often constructed out of stone or brick, which was build to house a holy relic. The most important stupas contain relics of the Buddha or one of his followers and were build at sites which commemorated important events in the Buddha's life. Often around a large central stupa would be smaller ones. These smaller stupas housed votive offerings. The presentation and interment of votive offerings at holy sites were considered meritorious acts. Devout pilgrims visiting various holy sites and temples throughout Asia would either purchase small votive offerings or make their own (using molds "rented" from the temple or brought from home). These in-turn would be be presented to the shrine to be interred inside a stupa or taken home as a memento of their visit. The votive offerings varied from place to place and over time. 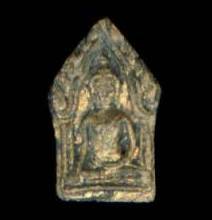 Typical votive items were often made of terracotta and included small plaques, sealings and stupas. Beginning in the 7th century CE in India, small miniature terracotta stupas became popular as votive offerings. These stupas were made by pressing clay into an appropriately shaped mold. After being pressed into the mold, the clay stupa would be removed and allowed to fully dry, then when finally dry, it would be fired to harden the clay. In this way, large numbers of them could easily be mass-produced. These small stupas could be simple and undecorated or adorned with images of the Buddha along with other decorative elements. Like the larger versions, these miniature stupas often contain a central 'relic' of some type. The 'relics' ranged from small terracotta sealings impressed with a Buddhist creed or prayer to small scrolls on paper. The purpose of the 'relic' is to sanctify the object. In some traditions, specific prayers and meditations were enough to sanctify the object. 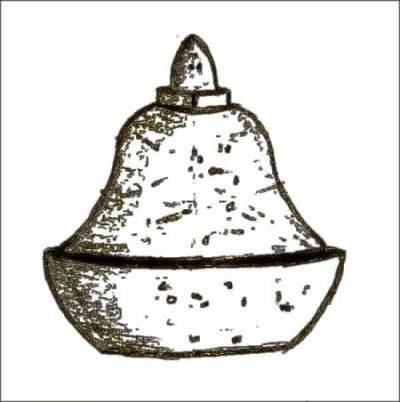 Drawing (based on examples from 7th-8th century CE India in the collection of the British Museum) of a small (6 to 8 cm high) terracotta votive stupa. These small stupas could be simple and undecorated or adorned with images of the Buddha along with other decorative elements. 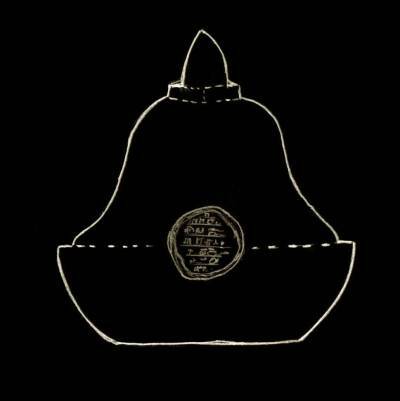 Cross-section drawing of a terracotta votive stupa showing the relative position of the central 'relic' chamber. The 'relic' inside these small stupas is often, a small terracotta seal which has been impressed by a stamp containing the Buddhist creed. They are made from fired clay. The decorative elements on both stupas include multiple stupas and bands of text. The stupa on the left is 2.5 cm high and the one on the right is 3.5 cm high. underside of the stupa bases. The example on the left shows a hollow space where a small scroll may have once been inserted. The one on the right is probably solid. 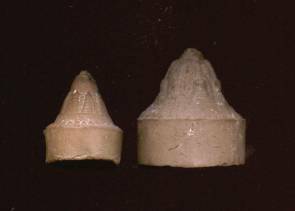 The diameter of the stupa on the left is 2.5 cm and the one on the right is 3.6 cm. 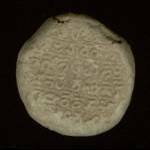 Buddhist sealings are simply small disks or lumps of clay which have been impressed with a seal. 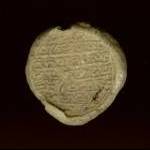 A seal is a a form of stamp which has been carved with an image and/or a text in reverse (so when used, the image or text will be normal). The stamps used were made out of metal, stone, bone or wood. 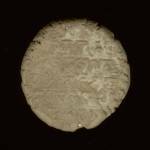 The clay after being stamped was generally fired. 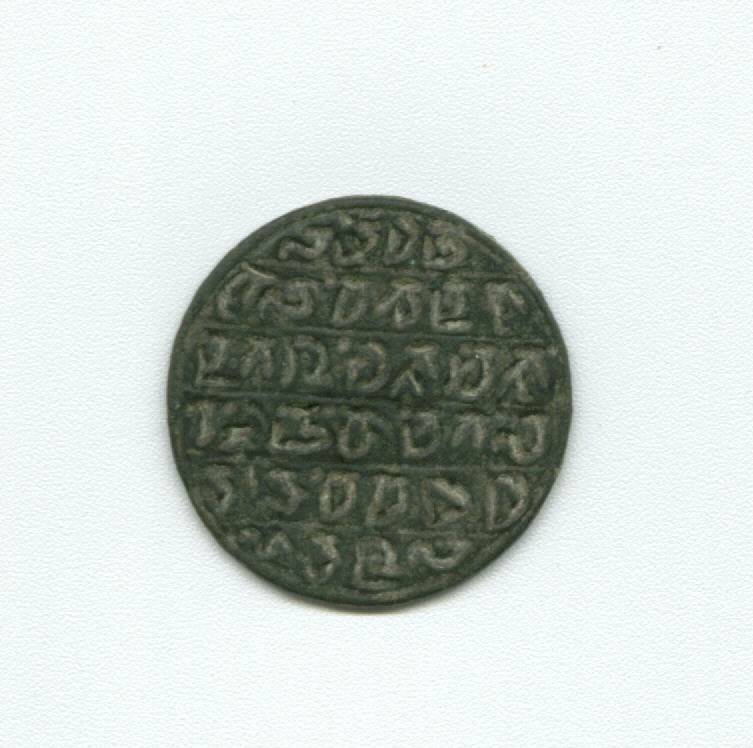 Bronze Seal engraved with 6 lines of text in a Brahmi script. Examples of terracotta votive Buddhist sealings from Eastern India. These date from the 7-12th century CE and contain a passage from the Ramayana in Brahmi script. The texts on these sealings vary from meaningless symbols (pesudo-writing), repeated mantras, passages from the Ramayana, the Buddhist creed and prayers, to 'seals' (symbols and/or texts) from or associated with different monasteries or rulers. 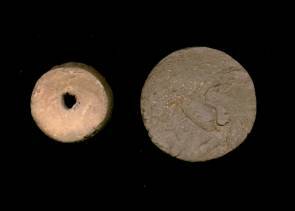 Because few early Buddhist manuscripts have survived in India, the writings found on these humble sealings provide a rare glimpse of the various scripts used in India and other places in Asia in ancient and early medieval times. The small seals were often included as the 'relic' sealed inside a small terracotta stupa. The sealings were presented by the faithful, either alone or inside a small stupa, to be interred in large stupas at a holy site. 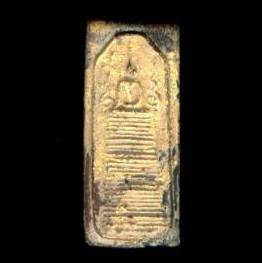 These simple sealings eventually evolved into the later more elaborate Buddhist plaques. In many parts of Asia, terracotta plaques are probably the most common Buddhist votive objects. They were made in large numbers out of fired clay which had been impressed in a mold. In some cases the plaques were gilded with gold leaf and even painted or glazed. The plaques come in a vast array of shapes and sizes and illustrate equally varied imagery. The most commonly encountered imagery on the plaques is that of the Buddha. In addition to the images, they may also include text containing the Buddhist creed or a prayer. Examples of gilded terracotta Buddhist plaques with images of the Buddha. These are from Indonesia and probably date to the 18th century or later. These simple items were most often sold to pilgrims visiting a particular temple. Many would in-turn, be presented to the temple to be interred inside a large stupa as an act of merit. Plaques also served other purposes. Votives used as memorials for the deceased. Many were widely used as talismans, to act as protective or healing charms. These charms could be fashioned into necklaces or simply placed in small, easily carried, bags or boxes. Some would also be placed in home shrines. While most plaques were fairly small, larger ones were made. Some of these were used to adorn the walls of temples and others were little free standing arched shrines showing scenes from the Buddha's life or multiple Buda images. In the Tibetan Buddhism of the Himalayan regions of Tibet, Nepal and Mongolia, the plaques are referred to as Tsa Tsas. Small terracotta items are probably the most common Buddhist votive offerings. However, they are not the only type of items used as votive offerings. Votive stupas were also made of wood, metal, and stone. Stupa relics include coins, texts (manuscript and printed), precious stones, beads, and other items. Small bronze Buddhas were buried at various sites. Offerings were not always interred, some were simply piled up to form small mounds or cairns. A good example of this practice is the carved mani or prayer stones, which can be found in piles along the summits of mountain passes or at the entrances to settlements in Tibet. Allen, Charles The Search for the Buddha. New York, Carroll & Graf Publisher (2002). Zwalf, W. (editor) Buddhism Art and Faith. New York, Macmillian Publishing Company (1985). Copyright © 2004, 2007, 2008 by Theodore Bernhardt. All Rights Reserved.